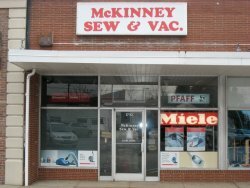 McKinney Sew & Vac have been a family owned business serving the Greensboro, NC area for over 32 years. We sell sewing machines and vacuum cleaners by such well known and reliable manufacturers as Pfaff, Husqvarna Viking, Brother and Miele as well as some Royal and Sebo vacuum cleaners. For McKinney Sew & Vac, service is a huge part of our business. We service and repair most models of sewing, embroidery and overlock machines as well as many brands of vacuum cleaners.